Push-lock loop-screws work the same as our standard push-lock screw posts, with the addition of an open loop on the screw head. The open loop allows for the attachment of beaded chain, wire, cord, monofilament line, plastic ties, metal hooks, etc. This allows the screw post to be used as a hanging point. The head diameter is 17/32”, the same as our large head screw posts. The loop is 0.21" wide x 0.105" tall. Designed for 1/4" diameter holes. The screws are molded from celcon, posts are molded from in polypropylene. Sold in sets of 100 (100 posts and 100 screws). Use for swatch books or fan decks as well as hanging points. The loop works with our 3/32" (#3) beaded chain. Use with nylon locking straps and hanging buttons. 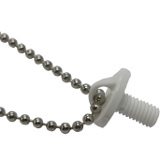 Loop screws also work with wire hooks and other hanging hardware for foam board signage. The posts and screws grip and hold simply by being pushed together; threading is not required.